Australia’s deteriorating security outlook, and what it means for our strategic relationships and our defence planning, has been a hot topic of late. Two key articles, by Paul Dibb  and Peter Jennings , highlight the growing strategic threats in our region, particularly if US security commitments begin to look shaky in coming years. Even if Australia’s defence alliance with the US remains on firm footing, we must be prepared to assume a greater share of the defence burden. As we consider how our changing strategic outlook might affect future force design, our air and naval forces should take priority given the maritime nature of the Indo-Pacific region. For the RAAF and, specifically, for the air force’s strike and air combat capability, we have some room for manoeuvre when considering future platforms. The RAAF’s 24 Super Hornets raise some interesting possibilities for force structure planners. As we’ve explored in past articles (here  and here ), the F/A-18Fs will be a viable capability for considerably longer than the 2030 replacement date suggested in the 2016 defence white paper. There’s no reason why they can’t be progressively upgraded  to Block III  standard by the mid-2020s, to become a high-end complement to the F-35. The upgrade would extend their operational service lives to 9,000 flight hours , and equip them with similar capabilities in avionics, sensors and data systems to F-35s, but with considerably greater payload. Certainly, the Block III Super Hornet isn’t as stealthy as the F-35. What may matter more is the ability to use the F-35 as a stealthy sensor and the Block III Super Hornet as a shooter to maximise their effectiveness. A mixed fleet would be more flexible than an all-F-35 (JSF) force. The Block III Super Hornet  represents a ‘4.5 generation’ capability, in a ‘high/very high’ mix with the F-35. Maintaining this mix also mitigates against the potential risk that adversary ground-based air-defence systems might increasingly incorporate more advanced counter-stealth capabilities that can direct long-range double-digit surface-to-air missiles and advanced multirole combat aircraft. Sensor developments include low-frequency radars  and quantum radar  that over time could erode the stealth advantage of an all-F-35 force. An upgrade to the Block III F/A-18F would be considerably cheaper than the unit cost of an entirely new F-35, which is on track  for around US$80 million per aircraft. Based on information provided by Boeing in 2016 and 2017, and ASPI research in 2017, it would cost around US$20 million per aircraft to upgrade a Block II F/A-18F to Block III, and US$8 million per aircraft to upgrade the EA-18G Growler to ‘Advanced Growler’. With 24 Super Hornets and 12 EA-18G Growlers, this represents a total cost of US$576 million for a fleet-wide upgrade, versus US$2.24 billion for a new squadron of 28 F-35s (not including their very high lifetime sustainment costs). That’s a big saving which opens up some interesting options for force development. The US$1.66 billion saved could be invested back into further enhancing the RAAF’s strike and air combat capability, potentially by expanding the overall number of planes it flies. 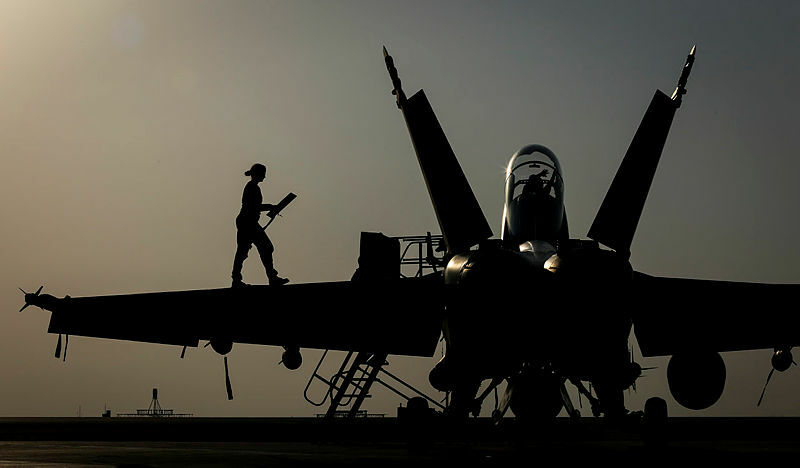 The savings could buy an additional 20 Block III Super Hornets or could be spent as ‘buy in’ to future capability programs, including unmanned combat aerial vehicles that will offer the RAAF the ability to exploit manned–unmanned teaming. Ultimately, the air force needs to think about what will come after the F-35 in the 2040s, and that’s a discussion that should start soon. In considering the first option of additional aircraft, is there a case for a larger strike and air combat force? One answer can be found in applying Lanchester’s square law, which Andrew Davies explained  in a 2014 Strategist piece (he even includes equations for the true geeks). The bottom line is that ‘doubling the force size quadruples its combat weight’. A larger force of 44 Block III Super Hornets would allow for more sorties and higher force concentration for less money than an additional 28 F-35s. Numbers matter, even in an era of stealth and precision weapons, particularly if the F-35’s stealth advantage is eroded. However, modern air combat is less about a single platform-on-platform contest than it is about a network-versus-network conflict. The F/A-18Fs and F-35s would be part of a system of systems that includes electronic attack, airborne early warning and control, long-range radar, space and even cyber capabilities. Calculating the true value of extra aircraft needs to incorporate the effects generated by this system-of-systems approach. Next year will mark the beginning of the quadrennial force structure review, and the force design process needs to assess how comparative qualitative balance in a system-of-systems framework is changing over time, and how quantitative factors could affect that change. The process should include a robust debate that tests the assumptions that drive current thinking about the future composition of Australia’s strike and air combat capability. All of this has a funding dimension, especially if the government decided to acquire the full complement of F-35s as well as expand and upgrade the Super Hornet fleet. Jennings rightly says that Australia must boost defence spending, arguing that ‘we should start to lift defence spending to reach 2.5 or 3% of gross national product in a decade’. That could certainly fund a larger strike and air combat capability force. A balance must be found and funds must not be spent unless they lead to real capability increases. In the next instalment, I’ll explore the issue of addressing capability gaps, before summarising the prospects offered by next-generation air combat capability programs for Australia.